Reliance tankless water heaters are high-efficiency and Energy Star gas-powered units that are designed for on-demand water heating in residential and light commercial applications. There are several sizes available for you to buy from Reliance manufacturer and divided into three groups; standard, Low NOx and condensing, all with an option for indoor and outdoor installation. Reliance tankless models have the attractive and modern look; while its low weight construction is making them perfect for installation on the wall and homes that lack in space. Reliance tankless technology is based on Takagi technology. All the Reliance tankless water heaters that are using conventional technology utilize one commercial-grade heat exchanger for long-lasting water heating, while the advanced electronics makes the process more accurate, reliable and convenient. The energy factor (EF) of the standard type heaters is approximately 0.82, which is much higher than the EF on conventional tank-type models. Reliance tankless water heaters that are found in low NOx group utilize the advanced modulating gas burner, designed to heat water efficiently and at the same time produce less greenhouse gases. The proper gas combustion, which is represented by the light blue and stable flame, can be seen and checked visually through the burner window located in the middle of the unit. 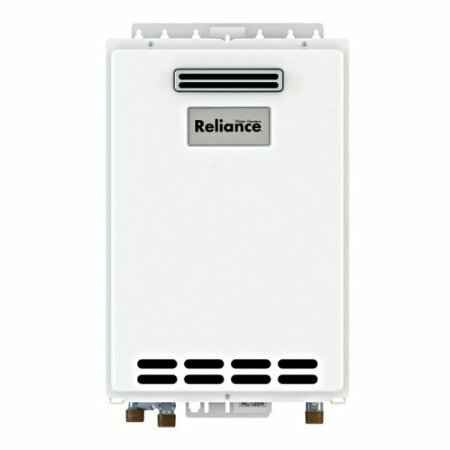 Condensing units from Reliance are coming from 320 and 520 series, and are the most advanced water heaters that utilize two heat exchangers and produce hot water with the ultra-high efficiency of 0.95. Another feature that makes them different from non-condensing models is the use of low-cost venting/exhaust system due to the low temperature of the products of combustion. Reliance tankless water heaters with the small and medium capacities are coming from the 110, 310 and 320 series and have the water flow rate of 6.6 and 8 GPM, which provides a continuous supply of hot water to homes with one to three bathrooms. Models from 510 and 520 series have a higher water flow of 9-10 GPM and are recommended for homes with up to four showers. The 510 and 520 models also use the Easy Link system, the communication cable, which allows connection of up to four of the same models and therefore increase the power and water flow. If none of the Reliance tankless water heaters can meet a demand for hot water of your home, an Easy Link system is a good solution. Condensing water heaters have an option to attach the recirculating pump to the pump control and work in four control modes. The benefits include the faster hot water delivery, higher recovery rate for storage tank applications and greater energy savings. All the units can use the remote controller for easy temperature adjustment and troubleshooting. The temperature can be set in the range from 99 F to 167 F, or 185 F on some models, while the diagnostic feature provides an error code whenever there is a problem with the unit. If the remote controller is not connected to the heater, the temperature of the hot water can be adjusted by changing the dip switch setting on the computer board. There are four settings (from 113 F to 140 F) for 110 and 310 models and eight settings for the 510 model (from 104 F to 185 F). A venting system is designed in a way so the proper air supply is provided at all times without obstructions. Improper or damaged venting can lead to the increased levels of carbon monoxide. By installing the direct vent kit, tankless water heaters will bring in all required combustible air from outside the home while the termination is through the wall. The air intake pipes can be made of various materials such as ABS, PVC, galvanized with the diameter of 3” while the exhaust system uses 4” Category III on non-condensing models. Pipes can run horizontally or vertically and the maximum length is 50 ft. The outdoor models, which are for the outside installation only, do not use the venting pipe system and are recommended for homes located in areas with the mild temperature climates. Reliance tankless water heaters are appropriate for heating potable water and space heating. Freeze protection system guards the water heater from low temperatures, only if the electrical power is provided and inside elements. Indoor and outdoor models available. Self-diagnostic system for safety, fast, easy and convenient troubleshooting. The error code is shown on the remote controller, if installed, or if not the 7-seg LED (320, 510 and 520 models) and blinking red LED for the 110 and 310 models. The computer board modulates gas and water valves so the unit can produce hot water with the correct temperature and reduced fluctuation.